American, Chinese, European and Russian negotiators sit down with their Iranian counterparts in Geneva this week to try to hammer out an interim deal aimed at freezing and eventually rolling back the Iranian nuclear program, an agreement that eluded them in early November. The prospect of an accord has generated new friction between Israel and the United States. The Obama administration wants to prevent the Iranians from ever obtaining nuclear weapons. The Israeli government wants to prevent Iran from ever having the ability to build such weapons. And Israeli Prime Minister Benjamin Netanyahu is pressing Washington not to finalize the deal now on the table in Geneva. American-Israeli differences on the issue in part mirror sharp differences between American and Israeli public opinion about Iran and about the seriousness of the threat posed by the Iranian nuclear program. Attitudes of younger Americans toward Iran suggest these differences may even grow over time. Three-quarters of Israelis have a very unfavorable view of Iran, while only 42% of Americans share such strong negative sentiments, according to a Pew Research Center survey in spring 2013. And the next generation of Americans, those currently between the ages of 18 and 29, are even less likely to see Tehran in a negative light. Just 25% have a very unfavorable opinion of Iran. Some of this, perhaps, could be explained by the perceived threat of Iran in their respective countries. While 85% of Israelis say that Iran’s nuclear program poses a major threat to Israel, just over half (54%) of Americans worry that Tehran’s nuclear program poses a major threat to the United States, including only 42% of the younger generation of Americans. Nevertheless, there is much common ground. 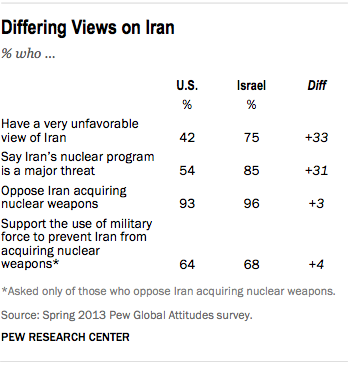 Americans (93%) and Israelis (96%) agree that Iran should not acquire nuclear weapons. And, of the vast majority of both populations that oppose Tehran’s nuclear ambitions, 68% of Israelis and 64% of Americans would support the use of military force to prevent Iran from acquiring nuclear weapons. NOTE: A previous version of this post inaccurately referred to Iran’s “nuclear weapons program.” It is a nuclear program.